After today's media event that saw the introduction of new iPads and new Macs, members of the press were invited to experience all of Apple's new products. Several sites have posted first impressions of Apple's 27-inch iMac with Retina 5K Display, which we've summarized to give users an overview of the company's newest desktop and its ultra high-resolution screen. Engadget says that the new 27-inch iMac has a "stunning display" with great viewing angles, and was left impressed with the all-in-one's image quality even at a resolution of 5120 x 2880. Brightness is said to be "level throughout" with no bleeding. 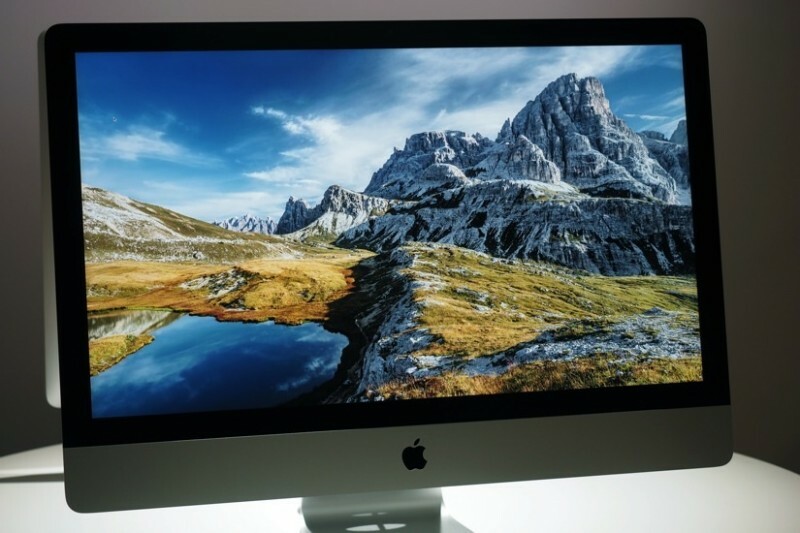 The website also praised the extra screen real-estate that the new 27-inch Retina iMac will allow for video editing. TechCrunch says that the iMac's display shows "full resolution photos with zoomed crops that look better than most originals coming out of the camera" and credits Apple for fitting such a panel into the same tapered design. The screen is noted as being a "huge step up" from the one found on the Retina MacBook Pro. Overall, the new 27-inch iMac is described to be "the future of desktop computing" and is even said to be right up there with Apple's Mac Pro in terms of choices for power users. The only thing we can really complain about based on our hands-on time is the price, which isn’t bad for what you’re getting but is still objectively pretty high. We’re glad to see Fusion Drives become standard (something we’d honestly like to see on every iMac and Mac Mini Apple ships), but 8GB of RAM seems a little low for a power-user-focused, $2500 computer. And the big drawback of all-in-one computers still applies—the machine’s internals are going to feel their age much faster than the display itself will. Finally, The Verge calls the desktop's new 5K display "incredible" with a crisp, sharp and accurate picture despite it being a bit reflective. The website notes that it initially worried about performance issues with the iMac now powering an ultra high-resolution screen, but a demonstration proved that performance "doesn't seem to be an issue." 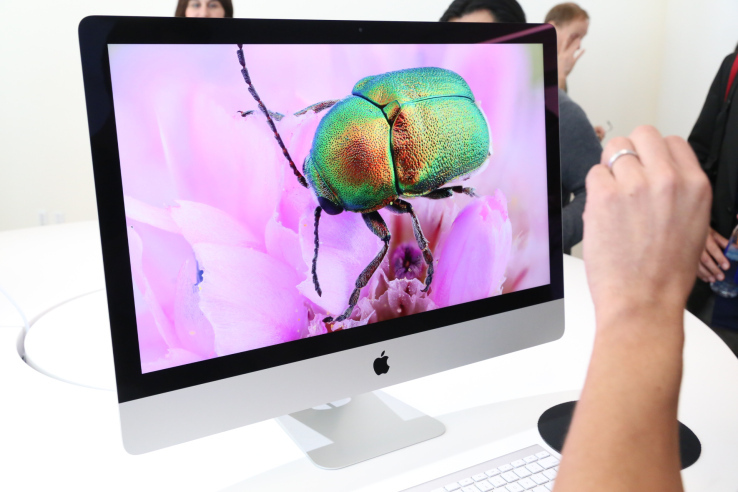 The new 27-inch iMac with Retina 5K display is shipping today. The base model starts at $2,499 and comes with a 3.5 GHz quad-core Intel i5 processor, AMD Radeon R9 M290X graphics processor, 8GB of RAM, and a 1TB Fusion Drive. Build-to-order configurations can also be outfitted with a 4.0 GHz quad-core Intel Core i7 processor and AMD Radeon R9 M295X graphics processor. So where's the 5k Apple monitor for the Mac Pro? I want and need this in my life. But there is absolutely nothing wrong with my specced out 2011 iMac. Guess I'll wait to see how the screens fare given the problems rMBP consumers had. Not enough money and too much sense for me to get one. Nice computer though. Gotta love the $600 upgrade from 8GB to 32 GB memory! Absolutely beyond ridiculous. Just price the stupid thing higher, we get it, it's a new state of the art display. But don't take us for idiots so you can advertise the price as "only" being $2499 when most people will at least want to upgrade some of the most basic specs. I wonder if the GPU will be sufficient in the long run? I am cautious of AMD since my 2011 MacBook Pro died. Still, this is a different series so maybe these machines will be up for it. Does anyone know how many external monitors can be connected to it, and what are the max resolutions? And where is the VESA mount option?? You mean this (http://store.apple.com/us/buy-mac/imac-retina-vesa) one? You guys are a bit overboard if you want this as average consumers. For professional video and photography editing, sure, but there is absolutely no other content that will look good on this screen for a long time to come. Um, no. That doesn't even make sense. It's a retina display, everything will look good. If you can't see the tiny details, no need for a sharp resolution and even less need for a 5K screen !!! Actually, retina screens help with presbyopia. I originally thought that it wouldn't matter and since I'm in that age range where I need to deal with bifocals/progressive lenses/reading glasses, I was happy to stick with my old 17" MBP because I thought that physical size was the only thing that would let me fit more content on the screen. But then I got a 15" rMBP for work and discovered that I can easily read as much or more content on the smaller screen as I could on the 17" due to the sharper text. Whenever I go back to my personal 17" non-retina laptop I find everything harder to read even though it is larger.